We aren't one for hyperbole. But when it comes to the ultimate shopping, dining and entertainment destination, magnificent doesn't begin to describe what's waiting for you on the most famous avenue in the world. Stroll on over just two blocks from our front door, then stop and savor the pure awesomeness spread out before you. Magnificent Mile shopping is unlike anything you've experienced before. The shops at Water Tower Place, flagship stores from the biggest names in retail and designer boutiques with funky finds vie for your pocketbook's attention. Tasty restaurants, bistros and cafés tempt you with gourmet fare and refreshing libations. Live theater, night clubs and concerts offer lots of after dark entertainment. And don't forget to stop and smell the roses - or whatever seasonal blooms are planted on a seasonal basis up and down the street. Did we mention that Michigan Avenue is home to the Festival of Lights Parade every year? Well it is, and you've gotta see it . . . millions of tiny white lights light up the 1 mile stretch from mid-November to mid January. and it is AWESOME! we call it the big city bling. Check it!! 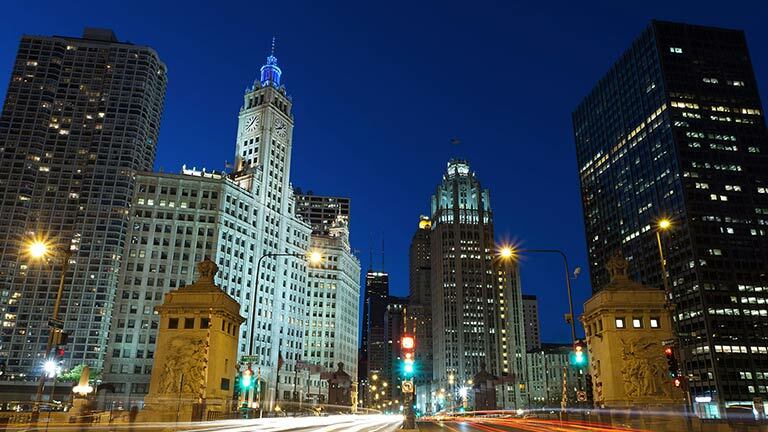 What are some of the top stores on the Magnificent Mile? Magnificent Mile shopping reads like a who's who of the best retail in the world. Saks Fifth Avenue, Bloomingdale's and Nordstrom bring you on-trend men's and women's apparel along with designer housewares and furnishings. Feeling a bit more indulgent? Add to your collections from boutiques like Gucci, Armani, Vuitton, Coach, Burberry and Chanel. MAC Cosmetics and Kiehl's keep you looking amazing. Treat the kiddos with a visit to The Disney Store and American Girl Place. And reward yourself with a bauble from Tiffany & Co. or Cartier. what sort of transportation options are available on the Magnificent Mile? It's ridiculously easy to get around on the Magnificent Mile. The Chicago Transit Authority's #13 bus runs up and down the Magnificent Mile with loads of drop-off points along the way. You can also grab the Red Line Train to the Chicago or Grand Avenues stops, then walk three blocks to the MM. And when all those shopping bags and reviving cocktails have you feeling like you can't walk another step, it's easy to hail a taxi anywhere on the Magnificent Mile. You will be back chilling in your room at ACME before you know it. World-class shopping literally around the corner. Morning Joe Coffee delivered to your room. Knock 'n Drop Room Service to start your day. FREE Hot Spot to Go so you're always connected.